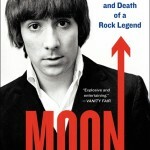 A serendipitous connection between two of my posts from last week: Pete Townshend is taking time away from publishing his memoirs online and touring with The Who to deliver the Keynote Conversation at this year’s South By Southwest festival in Austin, TX. This is one of the only SXSW events that would get me down there on my own dollar; and if I was there on anyone else’s dime, it’s just about the only thing that would find me sitting indoors in a hotel ballroom in the middle of the afternoon rather than wondering around Austin watching bands play on every street corner. Townshend, as we know, may be a pension-age first generation (British) rocker but he’s been more intellectually attuned to the power of internet than Clap Your Hands Say Yeah, The Arctic Fire and The Arcade Monkeys combined; I assume he will talk mostly about the power of the web and the changes it has enforced on us all in the way we make, disseminate and consume music. I applaud SXSW for bringing him down to Austin to speak to the indie kids and I hope SXSW will do the smart thing and make the address available via Podcast. If you think Pete Townshend’s had an interesting busy life, you may not have studied Gil’s resume of late: The 64-year old was born into poverty, began playing accordion at the age of 8, converted to bossa nova in his early 20s and embarked on a successful solo career in 1966. He was jailed by the military dictatorship in 1969 and forced into exile in Britain (along with Caetano Veloso), but returned to Brazil later in the 1970s to champion reggae music and the black Brazilian people’s African roots. After running successfully for office in his home city of Salvador in the 1990s, he was appointed Minister of Culture four years ago – the first black Brazilian ever to hold a cabinet position. 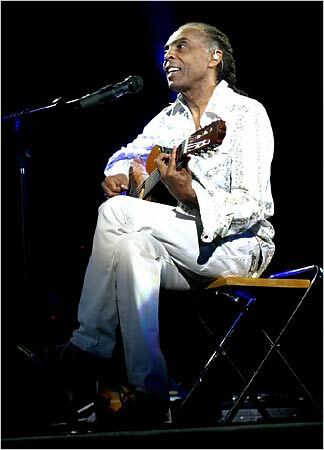 Gilberto Gil, musician extraordinaire: From poverty to fame to exile to Minister Of Culture. Again, I hope SXSW follows the obvious path and makes today’s interview available by podcast. And if you can’t make it to hear Gilberto Gil speak in Austin, you can always pick him up on tour: Gil will be playing Carnegie Hall on March 20. 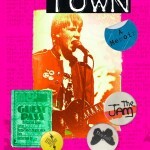 That night, Pete Townshend will be in San Antonio with The Who. You know what? These people actually make growing old look like fun.